In order to provide you with an accurate document translation quote for regular translations, we MUST be provided with an electronic copy of the document(s) requiring translation to properly assess the scope of work involved (language pair, type of document, word count, file format, technical difficulty, language resource availability, etc.). Please attach the document(s) in one of the following file formats: MSWord (*.doc or *.docx); Adobe Acrobat (*.pdf); PowerPoint (*.ppt or *.pptx); MSExcel (*.xls or *.xlsx) formats. CERTIFIED Translation Requests: Scan your documents — ideally in colour — or take a photo of them with your mobile device*. We do not need original documents for certified translations. *Please note: Photos are acceptable for quote purposes only. 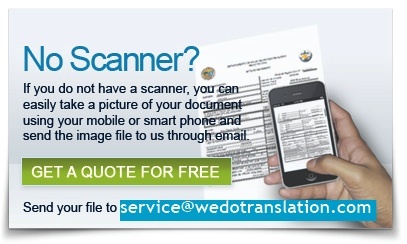 To proceed with a translation, you must supply us with a digital scan of your document(s). Use our convenient file upload feature on the quote request form or send us your files via service[at-sign]wedotranslation.com. Be sure to include your full contact information (name, phone number, e-mail address) and identify the language pair (e.g., Arabic to English). We also require a complete delivery address for certified translation assignments; in such cases, please enter delivery address with zip code or postal code in the Comments field. Please note that our courier service does not deliver to Post Office boxes. To cut down on SPAM and to ensure your privacy and security, we have included a Captcha box. Type the required words in the text field and then click the Submit Quote Request button. If you can't quite make out the words in the Captcha you can refresh it by clicking on the red circular arrow in the box. You will receive an e-mail from us confirming that your request has been received. This is an auto-response confirmation and you do not need to reply to this e-mail confirmation. You will receive a firm quote along with a payment request via e-mail before we begin the translation. Our quotes are personalized (not auto-generated from a template) and we normally respond by e-mail within 24 hours of receiving a request. Our methods of payment are VISA, MasterCard, AMEX or Discover. We also accept e-mail money transfers through RBC, TD, Scotiabank, CIBC or BMO. Please note that full payment for most first-time collaborations is required in advance before we can proceed with a translation project. We will e-mail you an invoice once we are in receipt of an e-mail confirmation from you to proceed with the translation project. The average turnaround time for certified translations is 3 to 4 business days plus courier delivery time (usually one business day (24 hours)). Regular translations are conveyed by e-mail. Site Map - Copyright ©2011 - wedotranslation inc. - All Rights Reserved.